This little gem, created using our wonderful Country White Organic Bread almost didn’t make it to our recipe collection because we couldn’t decide whether this sweet & scrumptious treat was better suited for breakfast or dessert. 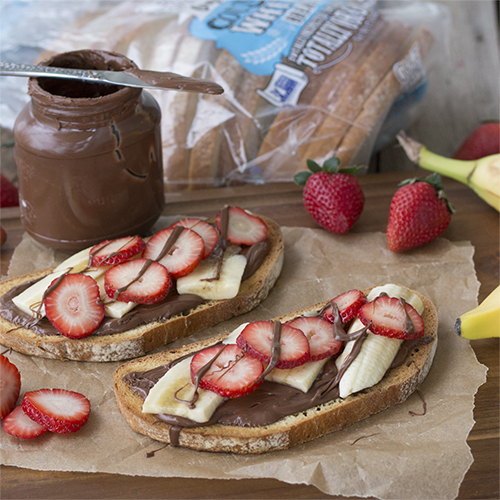 We agonized over this, eating as many servings as we could, never tiring of the sublime combination of tastes created by chocolate, fresh organic bread, perfectly-thin banana slices and juicy red ripe strawberries. Many meals later, we decided it could be both! Have ‘em whenever the mood strikes you, but don’t complain to us when your skinny jeans need to be let out. Delicious is always best enjoyed in moderation. Top each slice of toast with 2 tablespoons of chocolate spread. Arrange banana and strawberry slices on top and drizzle with extra chocolate, if desired.